A large falcon of the arid American West, the Prairie Falcon hunts medium-sized birds and mammals. The Prairie Falcon sometimes bathes in river shallows, but dust-bathing is probably more common than water-bathing, because of the general scarcity of standing water in its habitat. A large falcon of the arid west. The Prairie Falcon is nearly the size of the famous Peregrine, but differs in its hunting behavior, often pursuing small prey with rapid, maneuverable flight close to the ground. 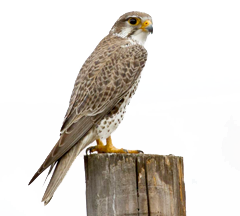 Adult Prairie Falcons are pale brown with back markings. They have a whitish chest with brown spots and bars. Prairie Falcons have a dark mustache marking on their faces, dark ear patches, long pointed wings and dark patches in their “armpits.” Juveniles, while similar to adults, have streaked or barred undersides, not spotted. Prairie Falcons forage by swooping at a low angle to surprise prey on the ground, or, less often, by stooping on their prey from high above. They also hunt birds (and sometimes bats) in flight by chasing them or diving through flocks. Flight is rapid and direct with shallow, stiff wing beats. Adults are highly territorial during the breeding season and will attack intruding Prairie Falcons with frequent stoops, loud sounds, and tail chases. Prairie Falcons inhabit grasslands, shrub-steppe, deserts, and other open areas of the West up to about 10,000 feet elevation. During the winter, they also reside in cultivated fields, lakeshores, desert scrub, as well as feedlots where European Starlings may provide a steady food source.